The All India Meeting of Field Directors of Tiger Reserves recently concluded in New Delhi, with the lauding of the efforts made by different stakeholders for protecting the tiger habitat. The Minister of State (I/C) for Environment & Forest Smt. 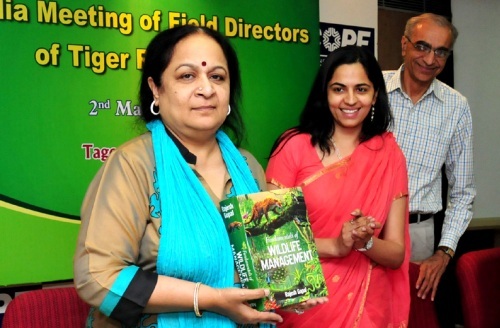 Jayanthi Natarajan presided over the meeting and stressed upon the increased focus on the tiger conservation since the last one year. The Centrally Sponsored Project Tiger Scheme was revised in August, 2011. Its allotment has been stepped up to Rs. 1216.86 Crores, especially to support the States for securing inviolate space for tigers. Several additional components have also been included such as (i) Change in the funding pattern in respect of North Eastern States, (ii) Raising compensation for man-animal conflict to Rs. 2 lakh, (iii) Acquisition of private land for making the core/ critical tiger habitat inviolate, (iv) establishment of Tiger Safari, interpretation/awareness centres under the existing component of ‘co-existence agenda in buffer/fringe areas’, and management of such centres through the respective Panchayati Raj Institution, and (v) Re-introduction of Cheetah. The meeting also highlighted the fact, solemnly agreed by the Minister, that tiger conservation is a collective responsibility between Government of India, State Governments and Civil Society. The tiger today need support form one and all. The meeting further highlighted the need for restoring the fringe areas of tiger reserves and the need for connecting forest linkages. The Meeting also saw the release of the book ‘Fundamentals of the Wildlife Management’ written by Dr. Rajesh Gopal, APCCF & MS (NTCA).